The Sanyo ECJ-HC55S is basically the same machine as the Sanyo ECJ-HC55H except that the “S” model is white, as you can see above, but the “H” model is dark grey. You can read a ECJ-HC55S and ECJ-HC55H comparison here. The rice cooker featured on this page is the younger brother of the Sanyo ECJ-HC100S which is a 10 cup machine. The ECJ-HC55S is a 5.5 cup capacity unit. What I like about this range of Sanyo rice cookers is that they have more than just rice cooker functionality. This may make one of these machines the best rice cooker for you. Personally I am most familiar with Zojirushi machines. They have the strongest reputation. However with this new style of multi-purpose machine they may well be coming under threat. Sanyo have devised a clever strategy of avoiding going head to head with Zojirushi and instead have developed a range of machines that offers something slightly different to Zojirushi. So there is most certainly space in the market for both brands. Of course, both these companies are Japanese manufacturers so we know that their products will be of the highest quality. To purchase a Sanyo ECJ-HC55S at the best price you may well want to take a look at the official Sanyo website. At the time of writing (November 15, 2010) they are selling this unit for $159.99. This is the price that you have to try and beat. 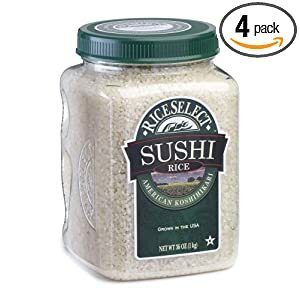 A good place to compare prices is at the Amazon online shopping store. You will likely find that the price they are selling this machine for is lower than the Sanyo list price. Another good thing about ordering through Amazon is that they offer free delivery. As I mentioned above, this rice cooker is able to do lots more than just prepare rice. It actually comes with a variety of different parts that are used inside the machine depending on what you are trying to cook. There is an inner pot and lid for rice cooking. Then there is another pot and inner lid if you want to use the slow cooker setting. In addition there is a special steamer tray that sits on top of the rice cooking pot. Finally there is a tofu container that you can use to make your own tofu. Therefore this machine offers a range of one pot cooking functionality for you to choose. If we compare this machine to one like the Zojirushi NS-WAC10 we can see that the Sanyo has by far the greater number of cooking settings and options. But the Zojirushi machine is designed by the premium rice cooker company. To be honest, it is hard to argue that the Zojirushi machine is better because the ECJ-HC55S clearly beats it in so many areas. The Sanyo machine is in fact a Fuzzy Logic machine. To get this functionality in a Zojirushi, you have to pay a fair bit more and go for the NS-ZCC10 model. 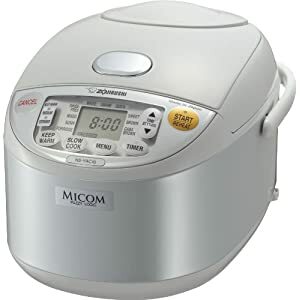 One Comment on "Best Price Sanyo ECJ-HC55S"
Your site has been more than helpful in my search for a rice cooker and I will probably continue to come back to it even after I get mine. Two questions plague me and keep me from my final purchase. I really don’t like the nonstick “coatings” that abound, I feel these can “off-gas” into the food or scratch off into the food as it breaks down in age, are there any cookers that have a ceramic or metal pan? and second. for a family of 4 do I get a 5 to 5.5 C or a 10 cup? most of the time I make only 2C dry rice, but does this leave room for steaming veggies or such on top? Thanks for your help. Keep up the good work!